Throwback to a custom wedding card made last year for a couple I’ve never met. In late 2015 I started accepting orders for custom-made cards. This fact still kind of boggles my mind. I never figured I’d be a cardmaker at all. 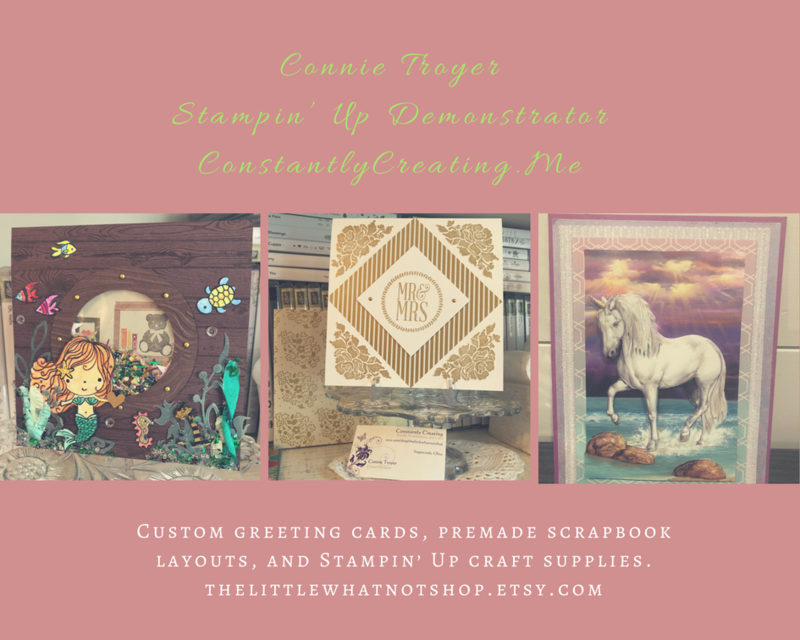 I’m a scrapbooker–since the mid-nineties. Cards were confusing. Such a small canvas on which to put so much stuff! Give me a 12×12 page any day, thank you. But somehow with the purchase of my friend’s used Cricut, cards suddenly made sense, like that proverbial light bulb over the head. Someday maybe I’ll show those first three cards I made as I attempted to figure out the chirping machine. So fast-forward a couple of years and suddenly I’m at the point of taking custom card orders…? Um, okay. If you say so. Indeed, it seems that’s what I mostly do now. Instead of creating cards for fun, for friends, for a local church group, for Hospice, etc., like I imagined I might do, family and friends and a particular lady in North Carolina have kept me very busy making cards for them ever since August 2015. And I’m grateful. (Though still boggling.) Here is one of the examples I made for a relative, so she could give it to a couple with a wedding gift. It is a twist on a version I made for my NC lady the year before that (why recreate the wheel if you don’t have to? ), but in this version, I personalized it with the recipient couple’s names. I used a premade, glittered card base from DCWV (5.5×5.5 size), added some light blue/grey patterned paper on top of it as a mat, and then ran some dark blue Recollections paper through my Fiskars handheld (hand-cranked) paper crimper tool. Their wedding color was dark blue, and I thought it would pair well with the Soft Sky color I’d used in the earlier NC version, which was still in my head. I decided I didn’t like the look of it by itself on the corrugated paper, not to mention that it is a delicate thing and would be hard to glue on top of the corrugation, so I glued the heart die-cut to another piece of the dark blue Recollections paper (that I did not run through the crimper). I then stamped out the little matching flowers of the corresponding Bloomin’ Love photopolymer stamp set in Soft Sky ink, die-cut them with the matching thinlit, and glued them on top in the appropriate places. I actually found it difficult to die-cut those without one edge or the other slipping and not staying centered where I put it. I have a number of rejects I didn’t deem “good enough” for the card. Must need more practice. Before I glued the heart die-cut down, I laid it out to see where I wanted it, marked it, removed it, and then wrapped some Soft Sky Seam Binding ribbon twice around the corrugated paper and tried to tie a bow off to where the side of the heart would be. This step was trickier than I thought it would be, but I do like the effect. And I used up some of my seam binding ribbon, which pleased me immensely. I think it’s pretty as a whole, but I struggle with using it because it is so delicate. I feel like using the word “fragile,” actually. It catches on things easily, gets holes easily, and is almost see-through. I feel like glue or strip tape can be seen underneath it as well, so I have a hard time finding ways to use it that aren’t simply bows. So this worked. (And after I use up my seam binding stash, I will never buy any again.) I think I actually made the bow separately from the ribbon wrap because I couldn’t get it to lay right. I believe I attached the bow with Zots after gluing down the heart. Then came the fiddly stuff. I stamped the tag that says “Always” from the retired SU Too Terrific Tags set in Soft Sky, cut it out (I don’t own the matching punch), and set it aside. Next I got out my retired Word Window punch and took it to some white cardstock. I then used some very retired SU Brilliant Blue eyelets from way back when, with my Crop-a-Dile at the tops of the “Always” tag and oval windows. I hand-wrote the couple’s names (more than once) and strung the three tags from the top ribbon with some SU Silver Baker’s Twine. I actually double-strung the “Always” tag to keep it the direction I wanted. And then because it was still not cooperating, I stuck a pop-up dot to the back of it and told it to stay put. The names still dangle sweetly as I imagined. All in all, I was pleased with the way this “version 2” card came out. Just for fun, here’s “version 1” that went to NC, in Soft Sky, kraft, white, and Crumb Cake. Version 1 also uses some distressed, stamped-on canvas. Thank you! It’s still surprising to me how it’s almost the same card yet they really do look completely different just because of color choices and paper treatment. The first one is so much fancier!